Almond milk is a delicious alternative for anyone looking for a healthy way to cut down on dairy products, avoid animal products, consume fewer calories, or simply try something new. Almond milk possesses a variety of vitamins and minerals, though many may stop short of calling it a “healthier” alternative to traditional organic, grass-fed milk. In fact, it naturally features far fewer nutrients than cow’s milk. It is often fortified with nutrients that make it comparable; however, the jury’s still out on any unique almond milk benefits. It’s also important to read labels very carefully, as many varieties of almond milk have plenty of added sugars that can lead to weight gain, insulin resistance, and metabolic disorders. But, if you purchase plain, unsweetened almond milk, you can get around the sugar content. If you’ve recently discovered you cannot digest lactose or have adopted a vegan diet, almond milk may be your best dairy-free milk option. Although almond milk is called “milk”—and it can be found in the dairy aisle in stores—it is not actually a dairy product. Vegans and those who are lactose intolerant can enjoy almond milk without fear, as can anyone who prefers something other than soy milk. People who drink almond milk may worry about missing the nutrients that dairy milk contains. This fear can be eased by taking a proper look at how the nutrients of almond milk stack up. A single cup, about eight fluid ounces, of almond milk contains 60 calories. The total fat content is 2.5 grams (g), with no saturated or trans fats being present. Almond milk contains no cholesterol, around 150 milligrams (mg) of sodium, 8 g of carbohydrates and 1 g of dietary fiber. Lastly, it has 1 g of protein, 200 mg of calcium, and 180 mg of potassium. In comparison, the same serving of skim milk contains 91 calories. Although skim milk contains only 0.6 g of fat, 0.4 g of that amount is saturated and also comes with 5 mg of cholesterol. Skim milk has 130 mg of sodium and 12.3 g of carbohydrates—all of which comes from sugars—and no fiber. Finally, one cup of skim milk contains 8.7 g of protein, 316.1 mg of calcium, and 419 mg of potassium. But, if you’re neither allergic/lactose intolerant nor vegan and are simply wondering about the nutrient content of almond milk vs. skim milk, skim milk may be the superior choice for you. *Stats reflect one cup (8 oz) of each milk. Plain almond milk has fewer calories than other types of milk. It should be noted that the carbohydrate content of the other milk varieties does not come from added sugars, but occurs naturally within them. This is important because these sugars are found in very small amounts and, when consumed in moderation, will not cause massive spikes in blood sugar. It’s also important to note the saturated fat content in one cup of reduced-fat cow’s milk or coconut milk will have a neutral effect on blood cholesterol levels and is highly unlikely to contribute to heart disease. It’s more about keeping your daily intake of saturated fat within recommended limits—no more than seven percent of total calories. Keep in mind that these values are only for the raw milks themselves. Almond milk purchased in-store is often fortified with extra nutrients, so pay attention to the labels and packaging. Plain, unsweetened almond milk will not have any sugar, which can help keep sugar intake low for people monitoring it closely. But, as mentioned, many forms of almond milk have sugar added to them, with typical servings supplying five 17 grams. Therefore, if you’re doing your best to cut sugar from your diet, you must avoid these types. Read the labels to ensure you’re getting plain almond milk without any added sugars. Although almonds are naturally a rather weak source of calcium when compared to dairy, calcium is often added during the production of almond milk. Bone density is one of the key features of a calcium-rich diet, thus almond milk with calcium added can encourage stronger bones and reduce the risk of osteoporosis. Some kinds of almond milk are enriched with up to 50% of the daily recommended calcium intake, making it an excellent source of calcium for vegans or the lactose intolerant. Almonds are a great natural source of vitamin E, the important fat-soluble vitamin, and that translates to almond milk. Almond milk is also fortified or enriched with additional vitamin E in some cases, making it a superior option if you’re not getting a lot of vitamin E elsewhere in your diet. One cup of almond milk can offer 20% to 50% of the daily requirement for vitamin E.
Vitamin E serves a number of important roles in the body, and acts as a powerful antioxidant to reduce inflammation. It can help protect your heart and eye health, while also helping to potentially prevent cancer. Because almond milk is high in vitamin E, it may help protect you from heart disease. Observational studies have shown regular consumption of nuts reduces the risk of heart disease. That said, research hasn’t confirmed the same results for drinking almond milk. That may be because another benefit of whole almonds (nuts) is that they are rich in monounsaturated fats, which are largely removed when almond milk is processed. The vitamin E from almond milk may encourage heart health, but an overall healthy lifestyle (nutrient-rich, low-calorie diet and regular exercise) remains your best defense against heart disease. Whole almonds, however, can have big-time benefits for heart health. 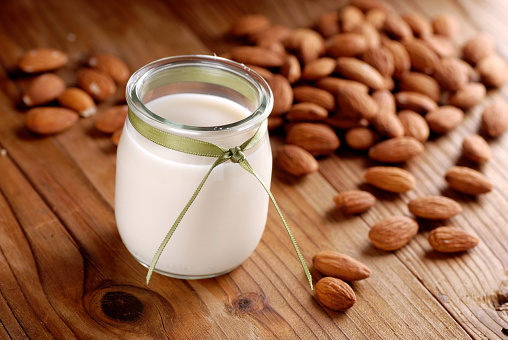 Most of the fat found in nuts, and therefore almond milk, are of the monosaturated variety. A few different studies have been done on the health effects of swapping nuts in place of carbohydrates and saturated fat, with a comprehensive review of the literature being performed in 1999. The results are quite encouraging. The review estimated that substituting an ounce of nuts for the equivalent amount of energy from carbohydrates in the average diet could produce a 30% reduction in coronary heart disease risk. If the nuts were substituted in place of saturated fat, the reduction became 45%. This means that drinking almond milk can become part of a more comprehensive diet effort for a healthier heart. Additionally, dairy milk is known to contain estrogen, which is capable of stimulating hormone-sensitive tumors like those found in prostate cancer. A 2011 study compared the effects of almond milk, dairy milk, and soy milk on prostate and breast cancer cells. Dairy milk produced an average of 30% increase in growth, while almond milk produced 30% suppression in prostate cancer cells. Unfortunately, no interaction was noted for breast cancer, save that soy milk seemed to stimulate growth. Some of the nutrients from almonds are absorbed by the water during the creation process. Almond milk is known to contain additional nutrients like magnesium, selenium, and vitamin E. Magnesium helps digestion by aiding the conversion of food into energy, and it also stimulates the parathyroid glands that promote bone health. Selenium is an immune supporter and helps fight off pathogens. Vitamin E has antioxidant properties and is a useful tool in eliminating free radicals within the body. Almond milk is also fortified with trace minerals like iron that can aid in wound healing and muscle quality. It might not be a great source of iron, but it can contribute to your overall nutrition intake for the day. Since almond milk is made with almonds, it can also pose an allergy risk. Almond milk doesn’t contain a lot of almonds, but it is still essentially a nut product. Anyone with a tree nut allergy may experience a reaction to drinking almond milk. The nature of the reaction will differ from person to person, but common symptoms include abdominal pain, diarrhea, congestion, nausea, itchiness, and shortness of breath. In extreme cases, anaphylaxis can occur and will require immediate medical attention. You can use almond milk in a variety of ways, from having a tall glass to pouring it over your oatmeal or cereal. You can add it to coffee of tea, or even mix it into a smoothie. It can be used in recipes calling for milk, or virtually any other spot where dairy milk would be used. Almond milk usesare just as versatile as those of dairy milk. Optional sweeteners like maple syrup or honey—but remember, if you’re looking for low calorie or low sugar, you’ll want to avoid these. Soak almonds overnight, or up to two days, by placing them in a bowl and covered in about an inch of water. Leave on the counter and cover with a cloth. You can also refrigerate them for two days. The longer they soak, the creamier your milk will be. Drain and rinse the almonds. Rinse under cool water. You’ll notice they are squishy. Discard the water used to soak. Pour two cups of fresh water and the almonds into a blender, pulsing a few times to break them up before blending continuously for about two minutes. The almonds will be broken down finely and you’ll see a white, opaque liquid. Press the milk from the almond meal with cheesecloth and twist closed. Squeeze and press the extract as much liquid as possible, which should be about two cups. If you can’t digest dairy because of an allergy or lactose intolerance, or if you’ve embraced a vegan diet, almond milk is a great way to acquire nutrients by way of a milk substitute. Just be sure to use unsweetened almond milk to save yourself from potentially harmful sugar and calories—it is also not a substitute for whole almonds. “Almond Milk Nutritional Facts,” Fitday web site; http://www.fitday.com/fitness-articles/nutrition/calories/almond-milk-nutritional-facts.html, last accessed September 14, 2015. “How many calories in Almond Milk,” Calorie King web site; http://www.calorieking.com/foods/calories-in-nut-drinks-almond-milk_f-ZmlkPTk4NDE1.html, last accessed September 14, 2015. “How many calories in Nonfat Milk,” Calorie King web site; http://www.calorieking.com/foods/calories-in-milk-flavored-milk-nonfat-milk_f-ZmlkPTY4NzE0.html, last accessed September 14, 2015. “How to Make Almond Milk,” WikiHow web site; http://www.wikihow.com/Make-Almond-Milk, last accessed September 14, 2015. Hu, F.B. et al., “Nut Consumption and Risk of Coronary Heart Disease: A Review of Epidemiologic Evidence,” Current Atherosclerosis Reports, 1991; 1(3): 204-09. Le Louer, B, et al., “[Severe Nutritional Deficiencies in Young Infants with Inappropriate Plant Milk Consumption],” Les Archives de Pédiatrie, 2014; 21(5): 483-88, doi:10.1016/j.arcped.2014.02.027. Tate, P.L, et al., “Milk Stimulates Growth of Prostate Cancer Cells in Culture,” Nutrition and Cancer, 2011; 63(8): 1361-366. Mandl, L., “9 Science-Based Health Benefits of Almond Milk” Healthline, December 24, 2017; https://www.healthline.com/nutrition/almond-milk-health-benefits, last accessed December 13, 2018. Arnarson, A., “Seven benefits of almond milk” Medical News Today, August 1, 2017; https://www.medicalnewstoday.com/articles/318612.php, last accessed December 13, 2018. Wright, J., et al, “The role of iron in the skin and cutaneous wound healing,” Frontiers in Pharmacology, 2014; 5: 156; https://www.ncbi.nlm.nih.gov/pmc/articles/PMC4091310/, last accessed December 13, 2018. Christensen, E., “How To Make Almond Milk at Home,” Kitchn, August 24, 2016; https://www.thekitchn.com/how-to-make-almond-milk-at-home-cooking-lessons-from-the-kitchn-189996, last accessed December 13, 2018. Krans, B., “Comparing Milks: Almond, Dairy, Soy, Rice, and Coconut,” March 31, 2017; https://www.healthline.com/health/milk-almond-cow-soy-rice, last accessed December 13, 2018. “Milk Line-up,” Western Bariatric Institute; https://www.westernbariatricinstitute.com/milks-not-created-equal/milk-chart/, last accessed December 13, 2018.